Seeds of ideas for young-adult disciples are sprouting in the DIRT at Tahlequah-First UMC. Church leaders didn’t wait on a potential New People New Places grant before they planted new ministries of "Discipling, Impacting, Reconciling, and Transforming" for people ages 18 to 35. They did apply for a grant, "but we said to ourselves this is important for us to do whether we get the grant or not," said Senior Pastor James Graham. The project began in August. The DIRT project draws on biblical imagery of God creating and planting. "We’re like a lot of congregations in that we don’t have a lot of young adults in our congregation. We understand we have to be reaching them," said Rev. Graham. In Tahlequah, 35 percent of the population is younger than 30. The church partners with the Wesley Foundation at Northeastern State University. Campus minister Shana Dry also is associate pastor at First Church. • On Monday evenings, 15-20 young adults attend DIRT Talk and share a simple meal at the Wesley Foundation. Rev. Dry leads. The "free-flowing conversation" has ranged from current events to Adam Hamilton’s book "When Christians Get It Wrong," Graham said. DIRT Church on Thursday evenings is casual and young-adult oriented but open to all, in the courtyard at First UMC. The teaching time is often interactive, Graham said. Up to 30 people participate. Young adults engage in mission through DIRT Movers. "The goal is to move people from conversation and spiritual growth to service and impacting our world in a positive way," Graham said. They have cooked and served meals to the hungry and have packed cleaning supplies for flood victims, among mission projects. • A Sunday School class recently began for that age group. Graham gleaned insights on church revitalization at the 2015 Large-Church Initiative, held in Georgia. "It’s not a cookie-cutter approach; context is everything," he said. The NPNP grant of almost $13,000 will help promote the ministries. 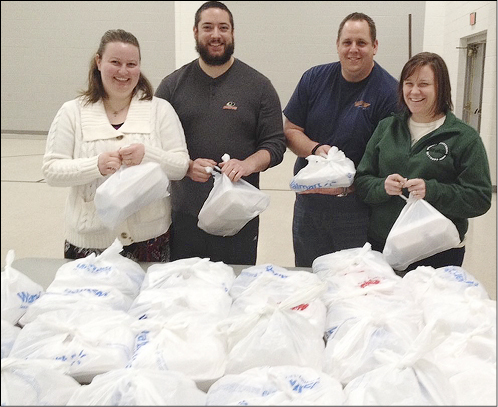 From left, Lauren and Jason Teter, with Cole and Courtney Martin, prepared 70 take-out meals to feed the hungry on New Year’s Day. The four DIRT Movers worked with the Tahlequah Area Coalition for the Homeless.